RP47280 is rated 2.2 out of 5 by 48. Rated 4 out of 5 by fred from needs maintenance I have had this dispenser for almost 2 years. like it was mentioned ,it does not pump as smoothly as it use to. I took the pump apart and greased the o-ring. it works like it use to now. I put some rubber hose on the pump and ran it to a gallon jug of soap. it seems to be working. Rated 5 out of 5 by Christy from Soap dispenser Love this soap dispenser! Looks more traditional and not so industrial because it has a curve! You fill it in the top and the hole is a little small. Remind them to put the funnel in the box when they mail it! Rated 4 out of 5 by Richard911 from Replacement parts?? We have had this pimp for a few years and has slowly stoped working. Now only getting a little soap out of it. The pump will no longer do a full stroke even after flushing a lot of water through it. This is a brushed stainless finish and can't find a replacement. Can you get just the pump?? Rated 2 out of 5 by JandP from Delta Faucet RP47280AR Allora, Soap/Lotion Dispenser I purchased this dispenser in July of 2014 and it worked fine for the first 2 years then the quantity of soap dispensed decreased gradually to zero over the course of 5 or 6 months. I removed the pump to see if there was a blockage and found pieces of black rubber falling out of the pump chamber. I suspect that the material is not compatible with the dishwashing soap and disintegrates over time. Rated 4 out of 5 by sody from You can fill from the top! I was about to write a nasty review but then I read the input from the Delta person and yes, you certainly can refill it from the top. It just takes a good tug. I am SO excited about this as there was no instructions and I realized that with my undercounted sink and disposal, I could NOT reach to refill it from the bottom. Thanks for the good customer information online! Rated 1 out of 5 by navyjim from If you enjoy crawling under your sink monthly to refill the soap bottle then buy. Purchased product thru Amazon. NO INSTRUCTIONS. Can not fill from the top. There were some other post on here that suggested that you had to forcibly pull up the whole spout but I am apparently not strong enough. Delta should recall this product. DO NOT BUY! I do have a problem call in to Delta. No response yet. Rated 2 out of 5 by granny27 from I like the looks of this dispenser, however, it hasn't held up. I have similiar issues with this dispenser as others . About 1pump , sometimes 2. Would not recommend. Matches faucet, but, has not held up. Not only does it not pump anymore, it squirts the soap all over , not just in the sink. Poor workmanship! Rated 1 out of 5 by Clone8 from Have issues with function of this soap dispenser. No longer pumps soap. We are unable to give this product a good review. We put all Delta fixtures in our home when we built and have issues with kitchen dish soap dispenser since the beginning. Pumping action is not productive, went from minimal dispensing to now nothing. From other responses, we are not sure we want to replace with same product even though we like the looks of the item. How do you refill dispenser #RP47280? Can this be refilled from the deck or is the only way to refill it by crawling under under the sink and taking the bottle out? Thank you for your question. 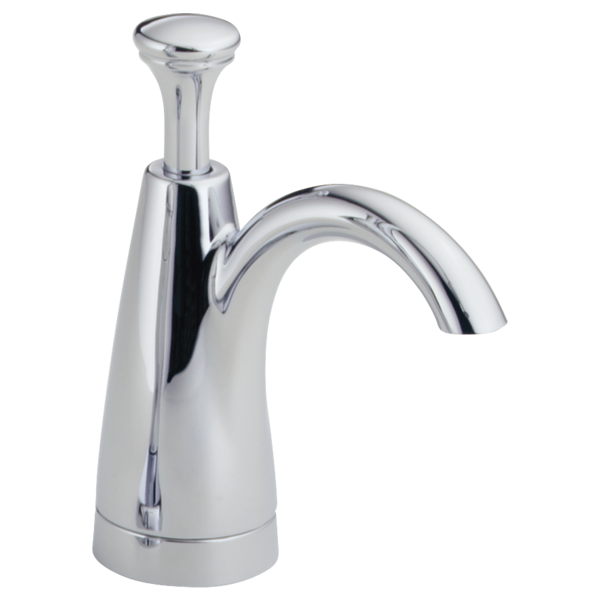 Delta Faucet part # RP47280 is recommended to be filled from the top. Just pull the pump out and pour the soap inside. We do not recommend unscrewing the bottle everytime to fill it. Why is there virtually no information in the document and spec tab? No height, how far the nozzle is away from the base,etc? only one dimension. Still do not understand how to refill RP47280 from the top. We do apologize that you are having trouble with this. The bottle is screwed onto the shank and the top of the soap dispenser is screwed onto the the other end. It should not fall if the two are taken apart. If you turn the soap dispenser about a quarter turn and then lift it off, you should be able to fill the bottle down through the shank. What is the part number of the pump for RP47280?? Is an adapter available to replace the 12 oz soap bottle with a gal jug under the sink? I was told that Delta made an adapter where a tube screwed into the dispenser instead of the 10.5 oz bottle and then lead to a gallon jug of lotion placed under the sink. Is this possible and where do I buy it. Amazon sells an adapter that should fit. Search for &quot;Never -Mt Soap Dispenser Kit&quot;. Has a one way valve in the plastic tube that prevents soap from flowing back in the jug under the sink. Use your own large jug. I can not figure out how to fill this soap dispenser. The only way I can refill this dispenser is by going under the cabinet and unscrewing the bottle. It is so difficult to unscrew this bottle. It is very tight where this is located. installation instructions didn't come with the soap dispenser. Where can I get the direction for installation?